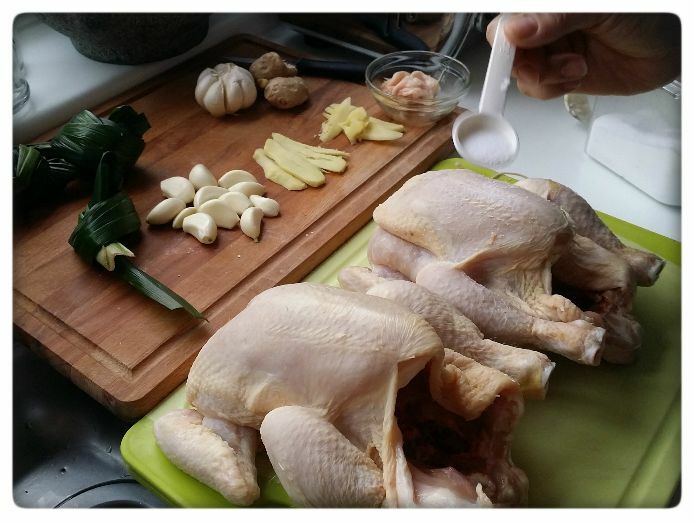 Preparing Chinese chicken stock, often a whole chicken is used in recipes. Poultry butchers or supermarket, just choose your preferred cut if you rather like using chicken legs/chops or breast fillets. You need to watch and adjust the cooking time, however when you can do try an organic corn fed chicken for a flavour range discovery. For a photo overview, click on this link for Hainan Chicken Rice step-by-step or start with the recipe. Here I share my method of poaching and stock variations for different results in flavour and taste with a variety of used ingredients. 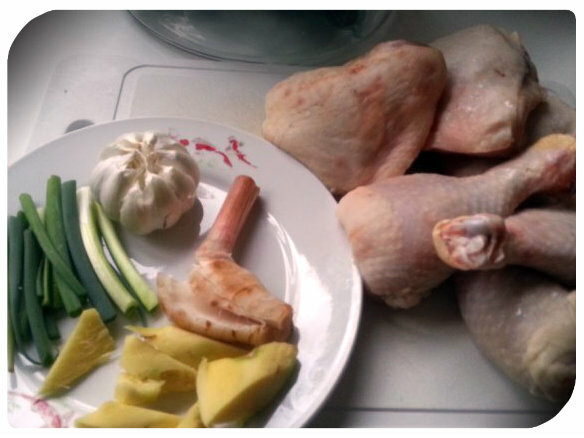 Broth method to poach: In this recipe, I use the whole chicken (chicken fillets or fish fillets), flavoured with Pandan leaves (or in the photo below a bunch of spring onion) garlic, ginger, Chinese wine and dash of pepper, bring to a boil. Add the chicken wait for the broth to come back to boil, turn down the heat, adjusting the level where you can see bubble’s breaking through the surface. For poaching, it is important to keep the heat near boiling point. 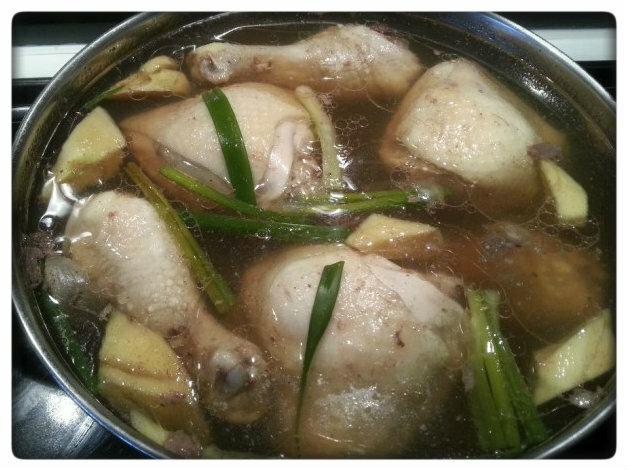 The chicken is lightly salted and peppered, cavity stuffed with leek, spring onion or pandan leaves, garlic & ginger slices then submerged into the stock. Try a variation of oriental herbs and spices (as with court bouillon), this will guarantee a good flavour base and incorporates flavour. Poaching remains and accentuates a burst of flavour impact. Cook for 15-20 min then turn the heat off it will cook in the residual heat remaining tenderness (if 1-2 chicken fillets only 10-12 min turn down the fire and let it cool in the stock). Cooking time may vary due to the weight and size of chicken, chicken breast, legs or wings make adjustments accordingly. Rule of thumb, check for an internal temperature reaching 73° C(this level eliminates bacteria) max. 75º C never below! Another poaching method is to place a double hook under the wings of the bird to slowly submerge into the boiling stock. When the bubbles subside pull out let the stock come back to a rolling point, submerge again and repeat 3-4 times till the meat is done. Preparing stock method: A standard stock uses pork bones and chickens carcases, which is stronger with more gelatin and intenser taste. Set a pot on the stove with cold water and the bones. Bring to a rolling boil, turn heat down to mid fire and remove all the greyish scum (blood and proteins) which floats up. Keep skimming the surface constantly. After 35-40 min removes the bones or as soon the grey scum subsides, clear the water. Start frying the chicken fat (if not enough or none available use a bit of lard, this is all for taste). Fry slices of ginger, garlic and spring onion. Add Chinese cooking wine, salt & pepper as soon as it all releases its aroma add water enough to cover it all this is the base. To make stronger infused stocks and stews at this point, you can add the following spices e.g. cinnamon, star anise, cardamom, cloves etc roast them first to release their aromas. Using spices in food to enhance flavour also adds a powerful antioxidant puch. Submerge whole chicken in the stock, depending on size and meat with bones or boneless for 15-45 minutes watching the colour changing from pink to milky white. With time experience will increase to recognise the various stages in the cooking process. After cooking time has finished lift carefully chicken up and pour the cavity empty into the pan. Plunge the chicken directly into an ice-cold water bowl. This stops the cooking process keeping tender meat with a jelly-like (pale-yellowish) skin. Finish with a final rub using a bit of sesame oil for shine and taste. Traditionally the cut up chicken meat (Bai Ji) was served with the bone still colouring a tiny bit of red, while the meat is perfectly cooked fully white without any trace of pink meat. You know when the cook kept a close eye because too long means it has lost its tenderness resulting in dry and hard meat. Herbal stewing method – a stock filled with medicinal Chinese herbal ingredients and seasonings to extract medicinal qualities. Often in a separate container referred as a “double boiling jar”. The soup in the double jar is cooked in a pan filled with water, this is a Chinese cooking method called double-boiling. It cooks through the heat of the water and not the original heat source (a bit like puddings in a hot water bath). Not to be confused with steaming. The double jar keeps all flavour, nutrients and essence all locked in while being cooked for several hours for extraction. This cooking method is mainly used for high regarded medicinal herbal ingredients (often expensive) and/or preparing soup tonics for strength and healing purposes. A step-by-step photo post will follow soon focusing on this technique. Steaming method – Chicken is chopped in pieces and marinated. Traditional the plate is placed in a wok (or a wide saute pan) on an elevated stand filled with rolling boiling water and a dome lid on top for full circulation of steam. Spread chicken pieces in a single layer on a platter surrounded with other ingredients as vegetables. Steam approximately 10-12min for chicken breast (thickness may influence steaming time). 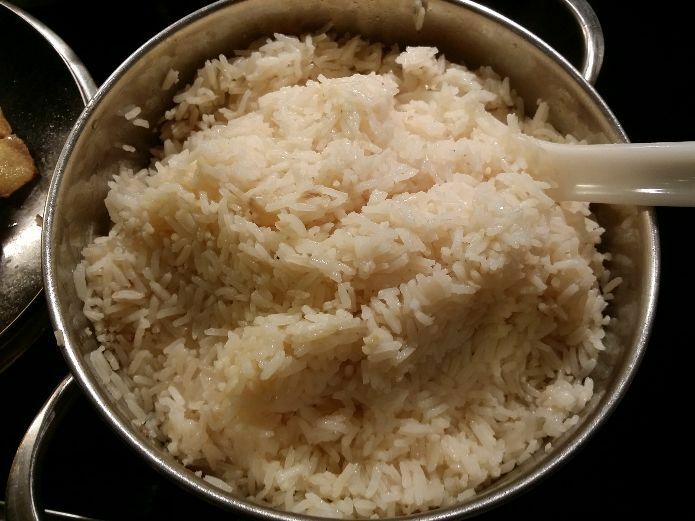 Using a steam cooking equipment or a rice cooker makes this, even more, easier with automatic settings no need to watch the clock and water level. When the temperature reaches 74º Celsius/15-20min it is done. Stove pot/pan method: Without a thermometer keep a close eye to the chicken bones, the meat turns from opaque to white and when the bone has turned light brown, the meat is cooked. However, if the bone turns dark brown in colour it means overdone, still good in flavour but less tender meat. Preparing nutritious homemade stock or broth is gaining popularity due to an unbeatable flavour. Poaching broth for chicken with the liquid often used in stir-fry dishes or a light clear (tea) soup. To cook the rice in the stock or the traditional way by first stir-frying chicken fat with ginger and garlic. As soon as it releases aroma add the rice while stirring coating the kernels all around (or use a pack Hainan Chicken rice paste). Add the stock and cook the rice till it is done. As soup base for various type of noodle soups. Hainan Chicken rice flavoured with chicken stock or paste. Serving of Chicken Rice: The Chicken is nicely cut in easy chopstick size with sliced cucumber and tomato complementing the meal. Served with a bowl of clear soup broth sprinkled with green onions or a bit of coriander on top. Accompanying dipping sauces; spicy chilli with ginger paste and dark soy sauce. For other serving style suggestions and information, read Hainan Chicken Rice foodie chat trivia post. Standard Chinese stock base – boil water add 4-5cm ginger and a whole bulb of garlic (quantities may vary according to weight and personal preferences, but this is what I use for a whole chicken). Additions of Pandan leaves, leek/green onion, Chinese wine, black pepper, use of light soy sauce (dark soy sauce is for colouring the stock more than flavour use sparingly). Chinese herbal stocks – the above with Chinese herbs to infuse the broth into a tonic to improve and strengthen the functioning of the body or increase the feeling of well-being. Most Chinese households carry their own favourite combination of herbs to aid, but Chinese herbs with medicinal qualities are widely available at Chinese Supermarkets and of course Chinese pharmacies in Chinatown or Traditional Chinese Medicine (TCM) practices. In Taiwan at the Shilin Night Market there’s a famous stall for 十全汤 literally translated “ten complete soup”, customers would line up every night. The making of this herbal soup starts during the day and simmers for hours impregnating the air filled with herbal fragrance, just smelling would flock customers through the whole evening and night. TCM practice believes bone broth nourishes our kidneys, supports our “chi” (life essence) and builds blood. Here is a link with informative facts including other recipes “Bone broth for health building” by Jade Institute. Cooking with bone broth especially with pork trotters will make a very good dish and soup stock, in our regional cooking the cooled stock turn gelatinous and is another favourite way to be eaten cold known as “dong jiao” 东郊. South-east Asian stock base – the above with additions of less ginger or none, with galangal, lemongrass, peppers or bird-eye chillies (hot), few leaves of kaffir lime leaves. Definitely a base for e.g. Thai Thom Yam soups or with the addition of spices as for making Vietnamese Cahn’s. Meat or Vegetarian stock base – with or without bones it often has onion, celery, carrots (and leeks). Enrich to get more taste is making use of bouquet-garni as in French cooking, a bundle of herbs traditionally comprises of bay leaf, thyme, parsley. Or an Italian herb mix of basil, oregano, rosemary and sage. 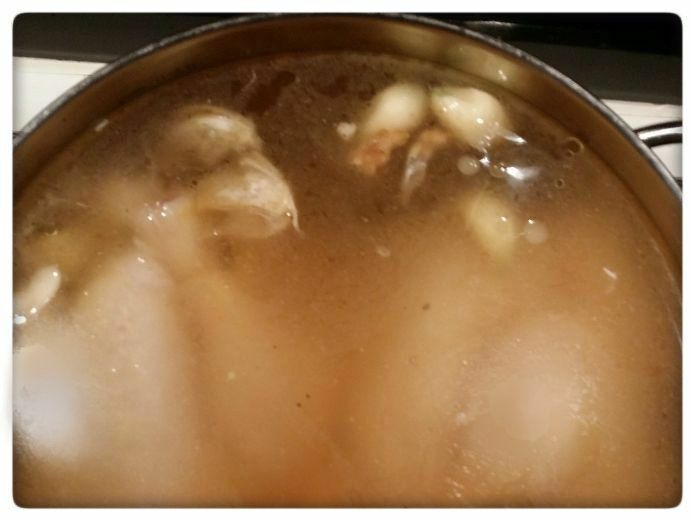 Blanching bones – Set up a pan with cold water add the whole chicken or other parts. The process of blanching chicken, pork meat and/or bones is to remove all impurities (blood and proteins solidify in froth or scum when heated) by skimming the surface and removing it will result in a clear instead of a cloudy stock. When cooking with pork bones I will change water definitely, with chicken it depends on the final dish. If fast and quick, I constantly skim the surface removing all scum till its clear and use the broth to continue or add ingredients for stock making process. Click on the links for Hainan Chicken Rice step-by-step photo tutorial, background information foodie chat trivia and recipe. By preparing the poaching liquid and making your own stock, most of the work is done. If you have any remarks or questions, please leave your comment here under or send me an e-mail.